Thanks to Target for sponsoring this post! All opinions are my own. Thank you for supporting the retailers that support Cella Jane. Fall is all about layering. Not only does layering look great, but it’s also entirely functional with the fall weather. I am so not ready to commit to winter coats yet! Today I am sharing some tips on how to best wear your layers. One of the keys with layering is to avoid looking bulky or over-layered. This is done by wearing thinner pieces underneath and balancing your fitted pieces with your looser fitted items. The other key with layering is to mix your textures and patterns. bulk to a minimum). I paired the sweater poncho with a beautiful faux fur collar – mixing the textures really polished off the look! Plus, it gives you an additional layer to warm (or cool) you if needed. 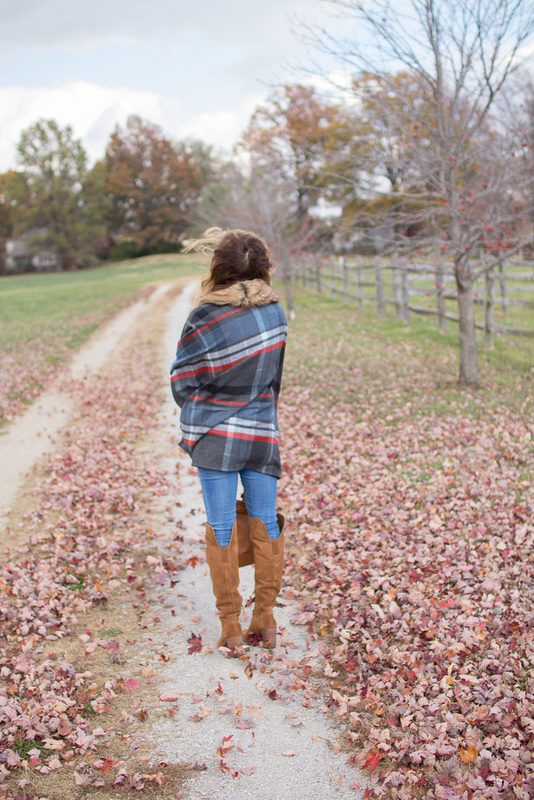 I am in love with the pattern on the second cape – who doesn’t love plaid for fall?! I paired a simple bucket bag with my fav over-the-knee boots. I encourage you to play around with your layering! Don’t be afraid to add another piece to add another element to your look and have fun with it! I love your scarf it is super chic ! I love both these casual chic looks. The plaid poncho is my favorite of the two looks. I love the color and I love the OTK boots with this look. I had to break out my winter coat for the first time this weekend. I hope to it warms up a little so I can go back to ponchos and capes for a while. You look fantastic. Oh I just love the second outfit that poncho is beyond perfect! !